It has been popular – indeed is now almost conventional – to describe prerevolutionary Yemen as having been isolated and backward; it has been characterised as ‘mediæval’ or as ‘the Tibet of the Middle East’ in many Western academic articles and journalistic reports. Yet the actual isolation was less than is commonly presented. While it would be absurd to suggest that Mutawakkilite Yemen was a highly developed country, judgements by Western writers of its backwardness seem to take as their reference point the sophisticated urban environment where such writers mostly resided. Yet to this day, basic living conditions in certain parts of rural Europe could be described as ‘backward’ or ‘primitive’. Often initial references to Yemen’s isolation are soon contradicted by the facts and figures (and bibliographies) presented by an author. A typical example is Dr K P Schmidt’s article on ‘Amphibians and Reptiles of Yemen’ in the December 1953 issue of Fieldiana,1 published by the Chicago Museum of Natural History. He wrote: ‘Yemen, the Kingdom of the Queen of Sheba in ancient times, has been almost completely closed to foreigners through much of its history’. However, in the next three sentences, Schmidt went on to mention the ‘Egyptian, Abyssinian, Arab and Turkish rule’ which north Yemen had experienced, the establishment of diplomatic relations with the US in 1946, and Yemen’s ‘invitation to foreign medical missions’ to assist the country. Among these were the US medical mission in 1951 and two Italian missions in 1928 and 1929. These are mentioned because they had herpetological by-products in which Schmidt was interested. Schmidt similarly mentions Niebuhr’s expedition of 1761–67, and the British Museum Expedition of 1937–38. (1934), and above all the steady flow of travellers who had published accounts of their visits to South West Arabia by the time Schmidt wrote. Cruttenden (1838); Arnaud (1845); Osgood (1854); Halevy (1872); von Wrede (1873); Millingen (1874); Langer (1882); Glaser (1884); Manzoni (1884); Glaser (1886), Haig (1887); Deflers (1889); Harris (1893); Hirsch (1897); Wavell (1911); Beneyton (1913); Jacob (1915); von Mücke (1917); Herbert (1924); Montagne (1930); Lamare (1930); al-Rihani (1930); Petrie (1932); Philby (1934); Nazih Mu’ayyad al-Azm (1938); Rossi (1939); Volta (1940); Robertson (1942); Clark (1947); Thesiger (1947); Faroughy (1949); Eilts (1952); Yavneeli (1952); Barer (1952); Heyworth-Dunne (1952); Hoogstraal (1952). In addition to these published writers, there were some who visited the region but did not record their experiences (such as the Tunisian intellectual Abdal-Aziz al-Tha’alabi who visited Aden in 1924). Robert Wilson, in his ‘Survey of Modern Sources for the Mapping of Yemen’,2 identifies several cartographers who produced maps (usually anonymously) but little or no literature. To be fair to Schmidt, knowledge of many of these authors is made feasible only through the internet, something to which Schmidt (et al) did not have access. Yet the articles by Clark, Eilts and Hoogstraal were all in the US National Geographic Magazine, and Hoogstraal’s was even entitled ‘Yemen Opens the Door to Progress’!3 The point remains that the routine description of Yemen by Schmidt – and by many others – as ‘almost completely closed to foreigners’ repeats the myth. Apart from foreign visitors, there were not a few foreign residents, both western and oriental. In 1886, Major-Genera F.T. Haig identified, in addition to the British ‘vice-consul, a Mahommedan gentleman on the Bombay Medical Establishment, half-a-dozen English and Americans resident [in Hodeidah], and a good many Greeks and other Levantines’.4 Fifty years later, Professor Faroughy noted the presence there of ‘about 100 Greeks, and 20 to 30 Europeans and Americans’. In Ta’iz in the 1950s, Skobeleff is even more detailed in her descriptions of personalities and their roles.6 Her White Russian companion, Dr Moshenetz, remained in Ta’iz with a coterie of foreign medics, until Imam Ahmad’s death in 1962. Greek merchants almost certainly trod the Incense Route, while a Greek mariner wrote the Periplus of the Erythraean Sea. In addition to such transients, there had been Greeks resident in highland Yemen in the Fourth Century AD, who cast the heroic bronze statues of King Dhamar Ali Yahbir and his son Tha’ran Yahna’am. Greek merchants also appear in several accounts of the modern era: Haig’s journey south to Aden is somewhat longer than normal, since he avoided the stretch of road north of the Ma’abar Pass where a Greek had been recently murdered. A few years later, W.B. Harris describes himself as being ‘the only European in the interior, with the exception of a few Greek shopkeepers’.7 Harris does not mention whether these are Hellenic or Anatolian Greeks – whether they came with the invading Turks (perhaps as sutlers), or independently. Perhaps because most did not write, and certainly because the few who did rarely wrote in English, the many Asian residents of, and visitors to, highland Yemen are usually ignored: in addition to the aforementioned 14 Arab writers Nazih al-Azm and Amin al-Rihani who published accounts of their visits to Yemen in the 1920s and 1930s, Professor Faroughy, reckoned that in the late 1940s Sana’a had a resident population of ‘60,000, of whom some 48,000 are Arabs; 7,000 to 8,000 Jews and 2,000 Levantines.’ He estimated that Hodeida had ‘a population of some 35,000 to 40,000, mostly Arabs of mixed blood. There are, in addition, some 2,000 to 3,000 Banians (Indian merchants), and 4,000 to 5,000 Hindus’. Imam Yahya attached importance to education, opening the first modern school in Sana’a in 1925, and by 1941 there were 500 schools across the country. Education was (nominally) compulsory from 7 to 17 years old, and followed the Iraqi curriculum. In the mid-1930s the Imam sent a group of cadets to Baghdad for military training with a view to improving the efficiency of his armed forces. Faroughy mentions the Iraqi Military Mission which the Imam invited to Yemen in 1940. This mission – which remained in the country until 1942 – has been mostly ignored, despite the account of it by one of its members, Staff Colonel Muhammad Hasan, in his book Qalb al-Yaman, published in Baghdad in 1947. The extensive Nasserite mission by the Egyptian Army is equally glossed over, despite its seminal role in the 1962 Revolution, for without the ideological (and technocratic) inspiration provided, it is unlikely that the republican mentality would have taken root, nor (without the prop of the nearly instantaneous Egyptian military intervention) would it have withstood the Imam’s counter-revolutionary operations. For a plethora of reasons – not least their long residence in Yemen dating back to the era of Jewish proselytising – it would be difficult to describe the Yemenite Jews as foreign residents. However, as a self-identifying global community, they had long had communication with Jews outside highland Yemen, the most famous example of which is Maimonides’s ‘Epistle to Yemen’. This was written in Cordoba in AD1172 in answer to a communication from Jacob ben Netan’el al-Fayyumi, the head of the Jewish community in Yemen. al-Fayyumi’s request for information argues at least an existing knowledge of (if not prior communication with) Maimonides in al-Andalus – at the far end of the Old World, and confidence that there was a reliable means of communication with him. Harris also notes that modern ‘rifles are being smuggled in by private traders from the French port at Obock.’ Faroughy mentions that following the Soviet Union’s treaty of commerce and friendship with Yemen in 1928, the Soviet mission organized permanent commercial exhibits of agriculture utensils at Sana’a and Hodeida’. By 1952, when the British and American Chargés d’Affaires attended the Ramadhan celebrations in Ta’iz, the viewing stand was clad in corrugated galvanised iron which is unlikely to have been brought in by camel. The ‘huge safe, open, with piles of banknotes filling the space’ must also have been imported by other means. Emigration has been an aspect of South Arabian society for thousands of years, singly or as a tribe; permanently or temporarily; far or near. Quite apart from the famous Hadhrami diaspora in the East Indies, Professor Halliday notes ‘the first [flow], beginning in the 1890s, led thousands of Yemenis, mainly from the North, to work on ships stopping at Aden’12 and that in ‘1955 35 per cent of the population of Aden – 48,000 people – were North Yemenis’. Whether either of these groups was from highland Yemen, or from the Shafa’i areas termed al-muntaqa al-wusta is unclear. Faroughy’s account is corroborated by Guillet, who employed many such Yemenis in his gruppo banda, in which they formed the infantry element. Skobeleff was met at Ta’iz airfield by a jeep and a truck, and she and Dr Moshenetz were provided by the Imam with a Ford car and chauffeur. She mentions the trucks of the Wendell Philips expedition to Ma’rib (which crossed the Ramlat al-Saba’tayn from Shabwa), which the Imam had impounded and kept in one of his palaces. Not only was there physical communication and travel within Yemen, but electro-magnetic as well: Haig mentions ‘that there is a telegraph line from Hodeida, via Menakha, to Sana’a, which appears to be kept in pretty good order, though merchants at Hodeida say it is sometimes quicker to send by post, though that is only once a week.’ Harris also mentions that ‘telegrams were pouring into Constantinople from Hodaidah beseeching assistance.’ Sinclair’s compendium of US Consular dispatches describes the Italians as completing a telegraph line on the same route (presumably this is refurbishing the Ottoman one, and extending it to Ta’iz) as well as establishing a large wireless station at Hodeidah. By 1952, there also seems to have been a telephone system, at least within Ta’iz, for Skobeleff mentions: ‘One morning we were called urgently by telephone from Sala’ [one of the Imam’s palaces.] Whether this system stretched to other cities (possibly strung on the same poles as the telegraph) she does not relate. The stamp on this Yemeni letter is worth noting. Not only is it printed in Rome, but it also depicts an aeroplane in 1952 (AH1373) symbolising the Imamate’s links with the outside world. 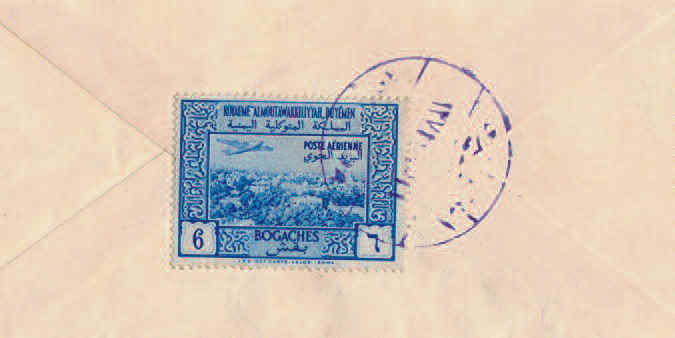 (Yemen was already a member of the International Postal Union and had post offices in its major towns). According to Skobeleff’s contemporaneous account of flying in just such an aeroplane, a DC-9 (by the picture she provides) flew from ‘Ta’iz for Aden every day of the week except Fridays. It comes to Aden in the morning and leaves in the afternoon; if there are passengers for Ta’iz, they are welcome.’ Later during her stay in Ta’iz, she took a photograph of ‘the Imam’s airplane perform[ing] maneuvers at the Ramadan parade’ – the aeroplane concerned is a high-winged light aircraft, thus a second one in addition to the DC9. While Halliday states that ‘no press was allowed in North Yemen’, Faroughy mentions that Imam Yahya ‘exercises his literary bent mostly in the publication of the governmental organ, the monthly al-Iman (The Faith).’ This official gazette was produced on the country’s one and only printing press set up in the 1930s. It was joined 1938–41 by Majallat al-Hikma, the country’s first ‘political’ magazine albeit constrained by being published under official auspices. In discussing Yemen, it is easy to slip into stereotypes of isolation and backwardness. Yet parts of contemporaneous Europe were not much more advanced than the Mutawakkilite Kingdom: the Blitzkrieg which captured France may have had petrol driven tanks, but its logistic tail was still horse- drawn. Even today, while a mud hut with a straw roof in Yemen might be described as ‘primitive’, estate agents prefer to use ‘picturesque’ or ‘traditional’ when marketing thatched, cob houses in rural Devon. Perhaps therefore instead of saying ‘Yemen was isolated’, it is safer to say that few visitors went to Yemen in the early to mid-twentieth Century who wrote and published accounts of their experiences in English. 3 Hoogstraal, H Yemen opens the door to progress Washington DC: National Geographic Society Vol 101, No 2, (1952) pps.213–244. 4 Haig, FT A Journey Through Yemen JRGS Vol. 9 No. VIII, (Aug 1887) . 5 Faroughy, A Introducing Yemen New York: Orientalia (1947) . 6 Skobeleff, A Light and Shadows: Memories of Yemen Portland: Mandaville Associates (1992) .